Blue Forest have been commissioned by the National Trust to renovate and rejuvenate the existing Adventure Play Area at Belton House, Grantham. 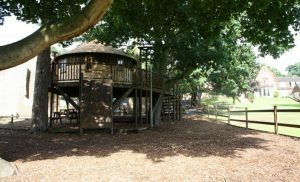 The Adventure Play Area is integral to the very spirit and identity of Belton House. Belton House is a classical English country home built in the 1680’s, with surrounding Italian and Dutch style gardens and historic 1,300 acre deer park. The estate is looked after by the National Trust and is open to the public with up to 300,000 visitors per year. Facilities also include a restaurant, café, indoor play area and gift shops. 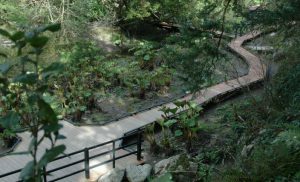 Sustainability was a key element to this woodland project. We were careful to ensure an environmentally sensitive approach to the development to avoid any further ground compaction and detrimental effect on trees. The original outdoor play area dated back to 1976 and as a result there had been a number of issues to address including root compaction, flooding and lack of public toilet facilities. It was decided that the play area needed a re-vamp, and Blue Forest were commissioned to create a new Woodland Adventure Playground. It was important that some of the original play features were incorporated into the new design because of the nostalgic element of the play area which has been enjoyed by generations of families visiting Belton. The new Belton House Playground is designed to connect children with the outside world in a fun and engaging way. It includes large, bespoke play structures, a new station for the miniature train, food kiosk and decked, woodland walkway. A spectacular new bridged entrance to the park crossing the River Witham is also incorporated. The design encourages children to play and explore changes in level, objects, spaces of different size, texture, colour, sound and material in a natural and safe environment. The larger tree house play structure is the main centrepiece of the playground, which consists of four decked platforms, scramble nets, climbing walls and a 9 meter tall play tower. The tower has an internal maze, mesh crawling tunnel and large stainless steel tube slide. The smaller play structure consists of four raised and decked platforms and inter-connecting rope bridges. Blue Forest have recently completed work on an innovative NHS woodland retreat to help vulnerable children at Fairfield General Hospital in Bury. The Hope and Horizon NHS Woodland Retreat will provide a soothing and uplifting environment which will positively affect the users and form a natural oasis within the stark institutional environment of the hospital buildings. 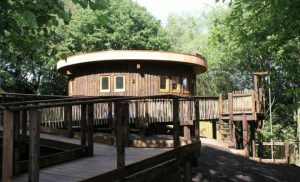 This inspirational tree house was completed for Feltonfleet Preparatory School in Cobham. The Feltonfleet school tree house has been designed as a unique, sustainable learning space and was opened by the Mayor and Mayoress of Elmbridge.